Before you lies what I expect is the most comprehensive coverage of CES 2014 "high-performance audio" exhibits available on the Web. 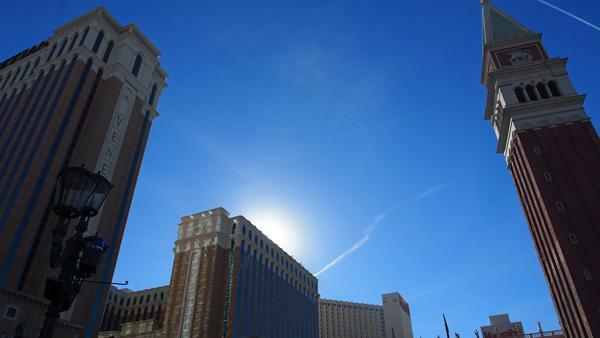 Combined with the online coverage at our sister web publications, AudioStream, InnerFidelity, and AnalogPlanet, it gives you far more than a snapshot of the vast array of new audio equipment on active and passive display at CES 2014 and T.H.E. Show. The implied optimism that motivates so much new equipment, and so many innovations, gives signs of strength and renewal in a world where listening habits and means of music distribution are ever-changing and, in the minds of many, evolving. No, the Model 7 is not new. In fact, the pair Richard Vandersteen was demming at the 2014 CES were the same pair Michael Fremer reviewed for this magazine in March 2010. 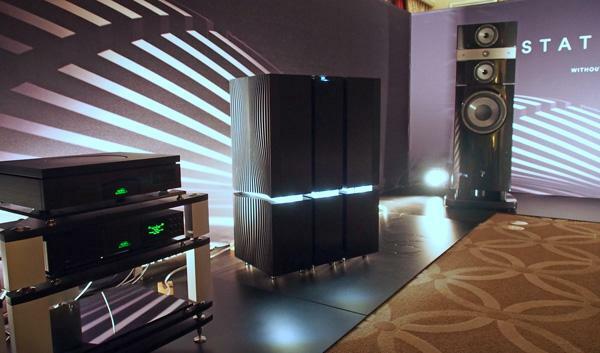 And the amplification wasn’t new: the M7-HPA monoblocks were shown in prototype form at the 2013 CES and the only news was that they are now in production at the same price as the speakers, $52,000/pair including proprietary DBS solid-silver cables, to give a system price of $104,000. But with an LP of Diana Krall singing Joni Mitchell’s “A Case of You,” the hairs on the back of my neck stood up, so powerfully physical was the presence of the singer in the room. Though English manufacturer Naim Audio has had some very affordable products in their line, like the original Nait integrated amplifier from the mid-1980s, their reputation for sound quality was established with relatively expensive models. 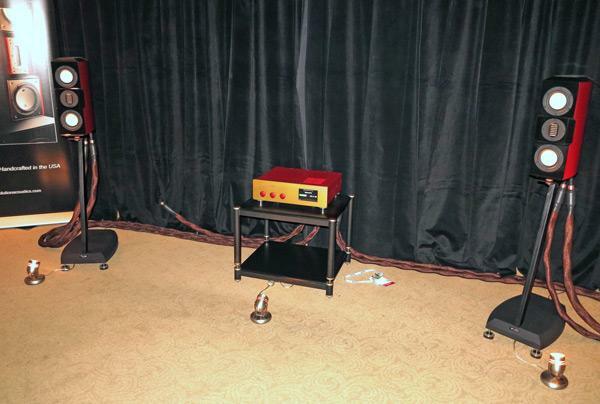 But nothing in the company’s history prepared me for the Naim Statement six-piece preamplifier/twin monoblock system (center in photo) that made its debut at CES. To be available in July, the Statement, which comprises the NAC S1 line preamplifier and two NAP S1 power amplifiers, will be priced at $200,000 and is specified as delivering one horsepower (740W) into 8 ohms! Its weight matches its power: the preamp weighs 135 lbs and the power amplifiers each weigh 222 lbs. 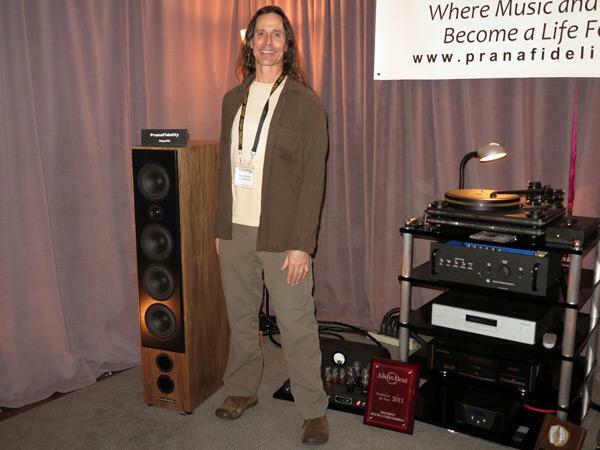 I can’t believe it was five years ago that I first heard the Wilson Sasha W/P speaker at a CES. Funnily enough, it was in the same suite at the Mirage so when I first entered this year I didn’t notice anything new. But then I realized that the speaker on the right in my photo was the same size as the Sashaokay, it’s ½” taller than the original Sasha, shown on the leftbut now resembles the larger Alexia that I reviewed in December, though the tweeter is now mounted in the same enclosure as the midrange unit. The Mk.2 Sasha costs $29,900/pair compared with the Mk.1's $27,900/pair. Laurence “Dic” Dickie (above) showed me his new G4 speaker design in the On A Higher Note suite at the Mirage, which will enter production in April. To be priced at $33,000/pair, the G4 features the same absorptive lines behind the tweeters and midrange drivers and the hybrid vented transmission line loading for the twin woofers first seen in the Giya G1. The upper and lower aluminum-dome HF units are the same as in all the Giya models, but because of the G4’s narrower width compared with the others, Dic had to design a new midrange unit. This again uses an aluminum cone and the same-sized radial magnet, but now there is an oversized dustcap to provide stiffening of the diaphragm midway between voice-coil and surround. 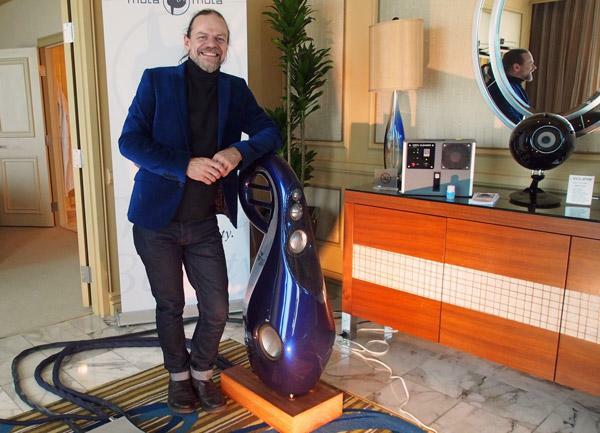 “A kiss back to Sony,” was how Nelson Pass described the debut of a unique pair of Pass Labs monoblocks driving Sony’s SS-AR1 speakers in the Sony room at Venetian. 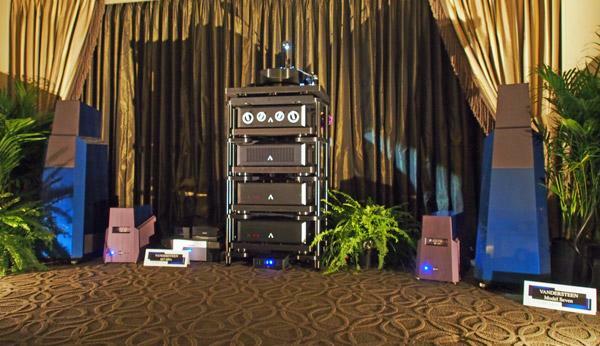 And it was an affectionate kiss indeedthe sound in this room, with a Pass Labs XP-20 preamplifier and Sony’s HA-P1ZES media player, I thought one of the best of the 2014 CES. Yes, it had superb clarity and dynamics, with an impossibly low noisefloor on the 24/176.4k Reference Recordings file of Stravinsky’s Firebird, but these qualities were even apparent on a Red Book file of a Rossini opera excerpt. There was something just right about the sound. 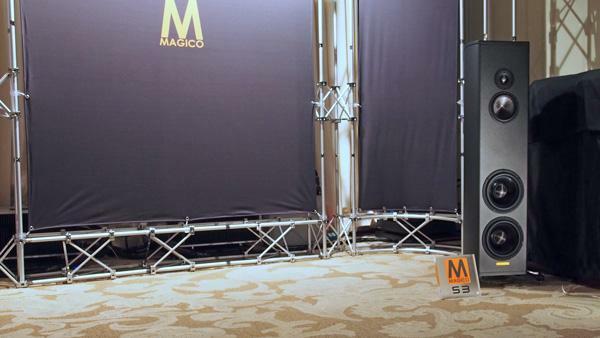 Daft Punk's "Within" was playing when I entered Magico's suite at the Venetian. 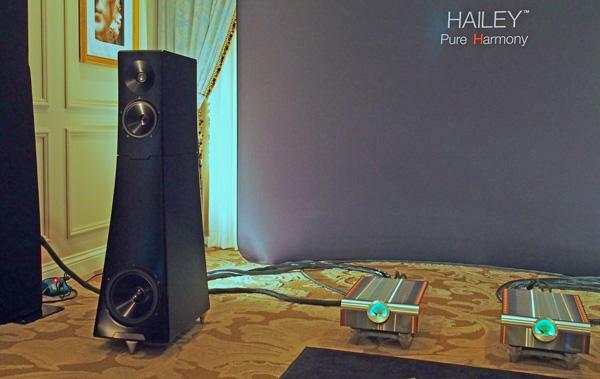 The sound produced by the pair of the new S3s ($22,600/pair) was large and dynamic, with rich low frequencies. A solo version of "God Bless the Child" followed, and Gregory Porter's baritone was uncolored, with a well-defined, palpable image hanging between the loudspeakers. Finally, the bass drum on Copland's Fanfare for the Common Man pressurized the large room with low frequencies, all this from a a pair of speakers, each with two 8" woofers in a sealed enclosure powered by 100Wpc of amplification, with source an Aurender server feeding data to a dCS Vivaldi DAC and a Vitus preamp. 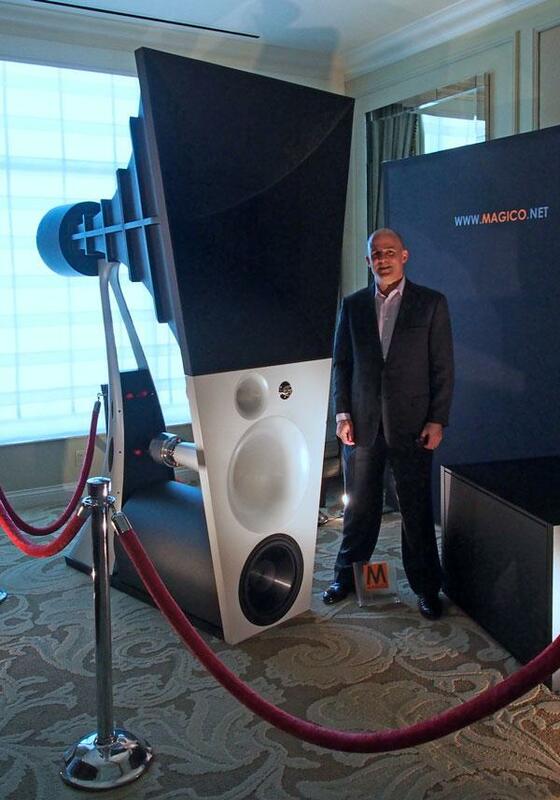 On passive display in the room adjoining their demonstration room was a single Magico Ultimate v.3 horn speaker, shown here with Magico's Alon Wolf for scale. 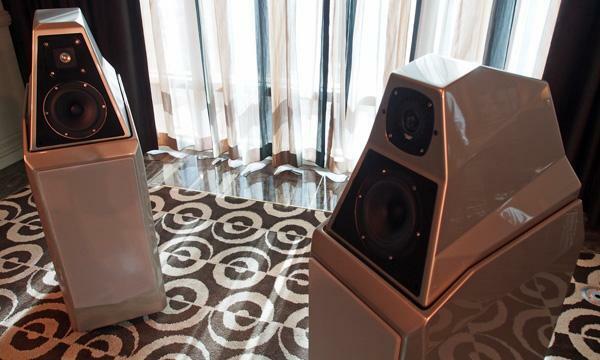 A five-way design costing a mind-boggling $600,000/system, the speaker’s higher-frequency horns feature a Tractrix flare, the lower-midrange horn a trapezoidal flare, all of which blend smoothly into the baffle. A 15" sealed-box woofer handles frequencies below 125Hz. DartZeel's prototype LHC-208 integrated line amplifier with double DSD DAC and full digital streaming capabilities ($TBD, due early summer) was hardly broken in, but its potential was beginning to emerge at T.H.E. Show. Thanks as well to Evolution Acoustics' MMMicroOne loudspeakers and the company's top-of-the-line cabling, I could hear into the heart of the Nash Ensemble's Red Book recording of Brahms Piano Quartet No.3 in c. No hi-res content was available, alas, given that a previous visit by an esteemed member of the press had inadvertently obliterated it. But the appetite was whet, especially by the potential of LHC-208's two clocks to eliminate jitter. Given the lateness of the hour, I could only snap a photo of the Italian Pearl Evolution Victor Ballerina 401/8 DPG loudspeaker ($14,000/pair) and grab a brochure. Slated for U.S. distribution, the three-way D'Appolito design with 89dB "sensibility"why do so many overseas companies dispense with professionals when they translate their literature into English?boasts a bass box that is equipped with a "Dynamic Pressure Gide (D.P.G) . . . a substantial and radical innovation in loudspeakers [sic] design. The D.P.G. differs from the usual internal bracingsthat only aim at reducing box vibrationsbecause it is intended to orientate a great part of air flow toward the CremonesiVenturi port, purportedly reducing air pressure on the box walls." 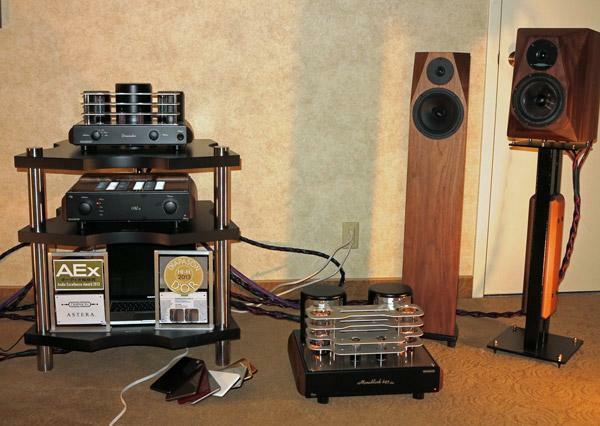 Formerly imported from Italy by May Audio, when Art Dudley reviewed their Mastersound 300 B S.E. 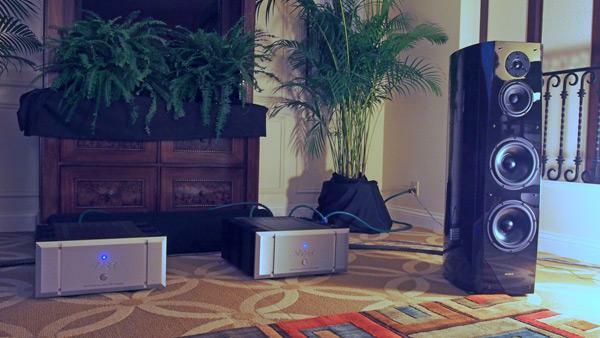 integrated amplifier, MasterSound may be poised to re-enter the US market. Through Diapason loudspeakers, I was intrigued with the sound of the Mastersound Final Amplifier 845 monoblock, a parallel single-ended eye-catcher. Mastersound's Dueundici preamplifier was also in the system. I regret that the lateness of the hour on T.H.E Show's final day did not allow me to gather more information. Named for the God of Wind, PranaFidelity's new 94 lb, Vayu/fs, two-way, quasi-linearray loudspeaker ($6950/pair), which has a claimed frequency response of 29Hz22kHz, an 8 ohm impedance, and 89.5dB sensitivity, was reproducing the exceedingly warm sound of Atma-Sphere's M-60 Mk.III.2, fully differentially balanced class-A, triode OTL monoblocks ($7200/pair) and MP-3 Mk.III.2 preamp ($5600$9000, depending upon options). 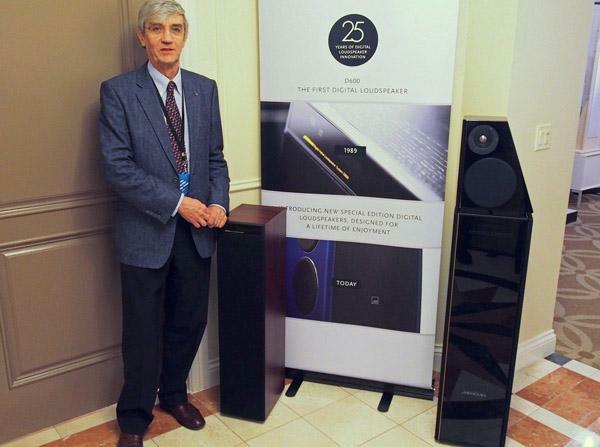 Has it really been a quarter century since Meridian introduced its first “digital active” loudspeaker, the D600, pictured left with designer Bob Stuart standing between the D600 and the DSP6000 from 1990. I reviewed the D600 in November 1989 and was mightily impressed by what I heard from a speaker that used Philips’ then-new S/PDIF receiver chip to allow it to realize DAC, crossover, and amplification in one, elegantly proportioned box. 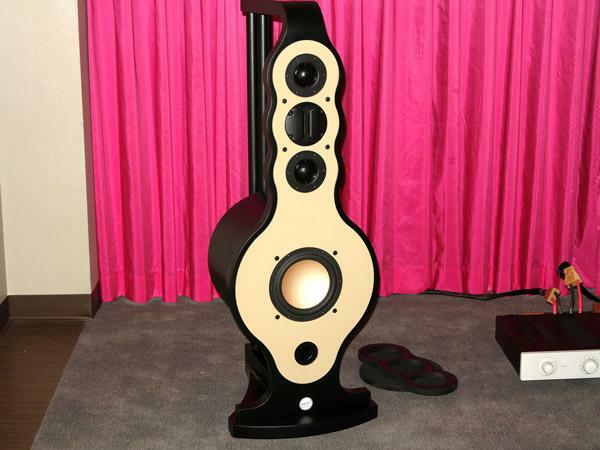 Second up from the bottom in YG’s speaker line has been the Kipod ($38,800/pair), named after YG founder Yoav Geva’s daughter Hailey, whose nickname was “Kipod” or “Hedgehog” in Hebrew. But as Hailey is growing up fast (as daughters do), it was time to name a new speaker after her; CES saw the premier of the YG Hailey. Priced at $42,800/pair, the three-way, floorstanding Hailey uses technology trickled down from the top-of-the line Sonja that I reviewed last July. YG’s “Billet-core” drivers, where the cones are machined from solid aluminum stock, are combined with a 1" dome tweeter in a machined aluminum enclosure that eschews the Sonja’s double-cabinet construction. 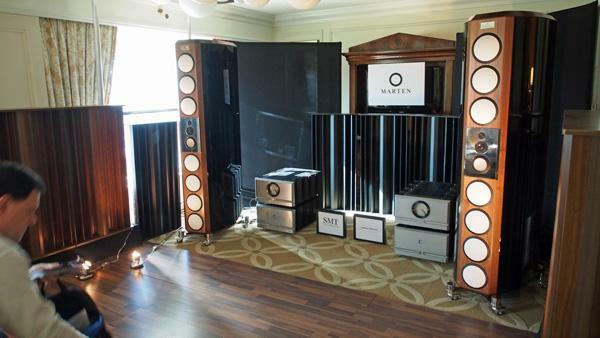 At almost 6’ high, weighing 507 lbs, and costing $480,000/pair, the Coltrane Supreme 2 from Swedish company Marten was one of the more extreme loudspeakers at the 2014 CES. But to my surprise, playing my own recording of the Jerome Harris Quartet playing Duke Ellington’s “The Mooche,” from the CD Rendezvous, it sounded delicately detailed, with a superbly stable rendering of the recording venue, Chad Kassem’s Blue Heaven Studio in Salina, KS.